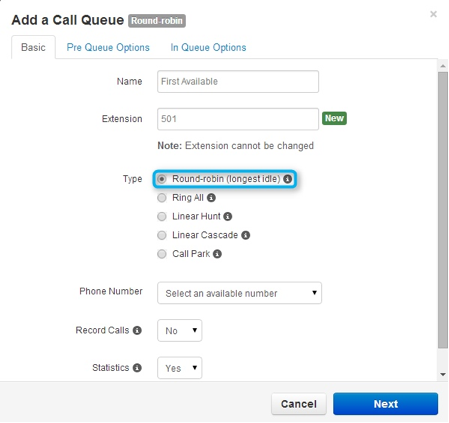 Round-robin (longest idle) – this type of queue routes callers to the available agent that has been idle longest. Ring All – this type of queue routes callers to all available agents at the same time. 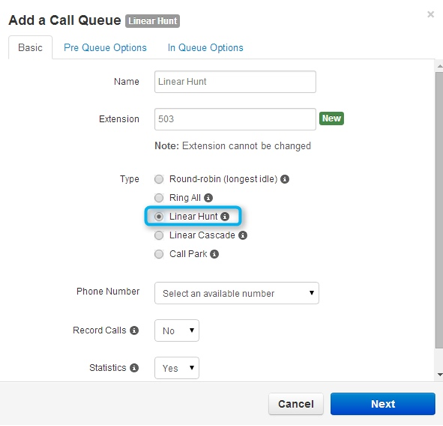 Linear Hunt – this type of queue routes callers to the available agents in a predefined order. The order is defined when editing the queue&apos;s agents. order. 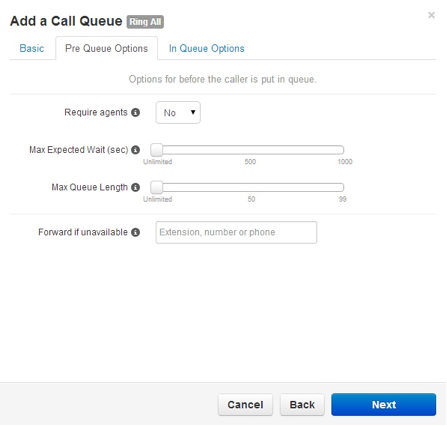 The order is defined when editing the queue&apos;s agents. and indicate this by showing the green New label to the right of the dialog box. 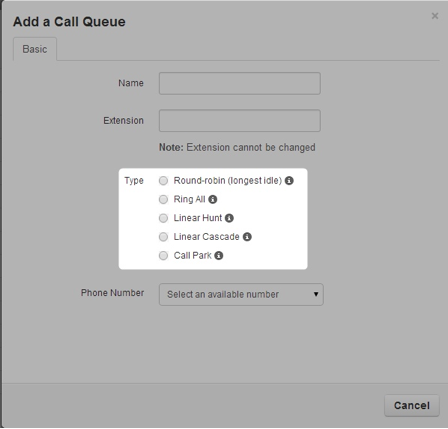 To create a Call Queue select the Add Call Queue button. Complete the form by entering a numeric name and an extension to be associated with it. 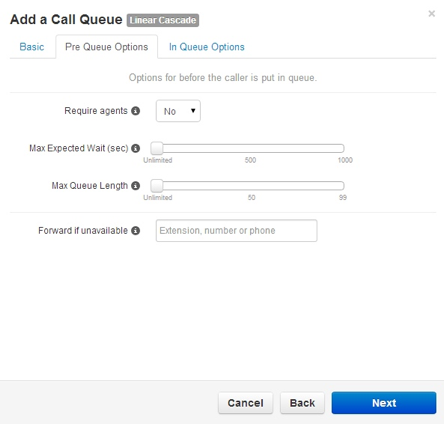 Once the queue has been named and numbered, the type of call queue must be selected. To enable round-robin select the radio button that displays “Round-robin (longest idle)”. queue from the Phone Number drop down box. applies when the queue&apos;s average wait time reaches the maximum expected wait. available. This should be less than the Queue Ring Timeout. Press 2 to leave a voicemail” and then return the call back to the queue if nothing is pressed. 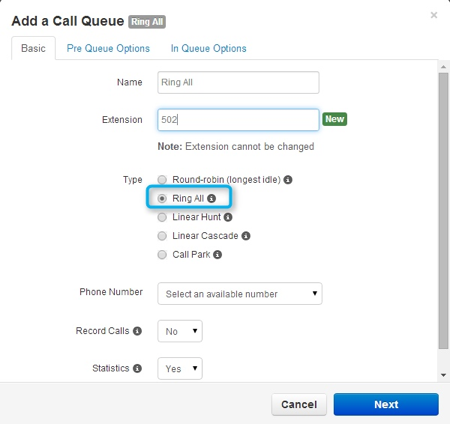 To enable ring-all select the radio button that displays “Ring All”. To enable linear hunt select the radio button that displays “Linear Hunt”. Forward if unanswered is not set. This will also trigger the system message; “Please continue to hold or Press 2 to leave a voicemail” and then return the call back to the queue if nothing is pressed. To enable linear cascade select the radio button that displays “Linear Cascade”. Agents to Ring Initially are the number of available agents to ring based on their predefined order. This is the first group of agents in the linear cascade.